Ford's Fusion Hybrid still can save you gas, but it no longer is eligible for federal green-car tax credits--and many cities and states are kicking hybrids out of HOV lanes, too. 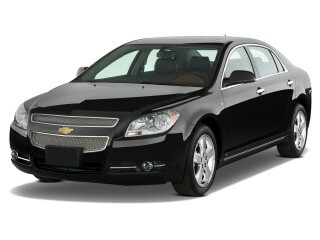 The 2012 Ford Fusion stays at the top of its game, especially as a Hybrid, with perky handling and its cut-above looks. The 2012 Ford Fusion marks the end of an era at Ford. After the Taurus lost the narrative in the mid-1990s, Ford's fortunes in the family-car segment faded--for a decade. The Fusion came along in 2006 and it's been a steadily growing sales success ever since, posting some of its best numbers this year even as Ford prepares a replacement for the 2013 model year. It's easy to see why the Fusion is popular. It starts with smart styling, a little aggressive in its thick-barred grille and squat taillamps. It owes a little bit to the Ford 427 concept car from the auto-show circuit, and it went on to influence designs like that of the 2010 Ford Taurus, now a full-sizer above the Fusion in the pecking order. From the side, the Fusion's pretty traditional, almost plain, but it's wearing well with age. The cabin walks the same tightrope, with a simple design and some rich-feeling pieces woven into a cleanly laid out set of controls. Almost everything looks good, in a traditional way, and the textures look and feel swell. It may not be the extrovert like the Kia Optima or Hyundai Sonata, but the Fusion still has a spring in its styling step, six years down the road. A choice of four engines, manual or automatic transmissions, gas or hybrid technology, and front- or all-wheel drive leaves plenty of room in the Fusion lineup for shoppers to find a good match. 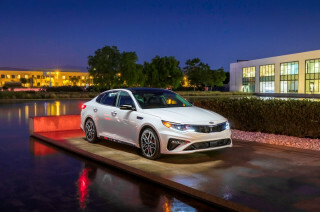 Base cars get a 175-horsepower, 2.5-liter four-cylinder engine and a six-speed manual transmission, with an automatic option. It's rare to find these in press fleets, but as luck would have it, we've rented three of these in showroom condition in the past year, and can judge it very competitive with some other base four-cylinders. It's responsive, not sluggish in the least, and the six-speed automatic actually improves fuel economy. We'd choose it before opting for the flex-fuel-capable 3.0-liter V-6. With 240 horsepower it's better in acceleration, but it groans as it delivers it, and fuel economy is just average. The Fusion Sport's 3.5-liter, 263-hp V-6 is a much better bet: it's happier to rev, much quicker than the horsepower difference indicates, and responds briskly through its paddle-shifted automatic. Gas mileage tops out at 25 mpg highway; adding all-wheel drive to the six-cylinder cars drops mileage by a mile per gallon in most cases. Given the budget, the Fusion Hybrid would be our default choice. It teams a 156-horsepower four-cylinder with an electric motor running at the equivalent of 40 horsepower, for a total of 196 hp. 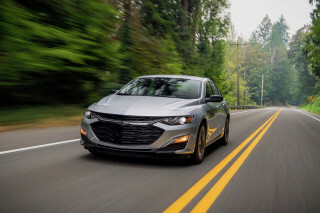 The Hybrid earns a 41/36 mpg EPA rating, has an EV-only driving mode at speeds of up to 47 mph, and has a smooth feel that's one of the best hybrid integrations this side of the Chevrolet Volt. The Hybrid's a Fusion calling card, but so is perky handling. 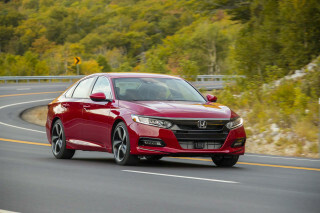 Its electric power steering is one of its better attributes, but so is its well-tuned ride, which doesn't have much body roll for a family sedan. It's not too stiff, even with big wheels and tires and tauter suspension on Sport models, and even with all-wheel drive, the Fusion just feels more agile than most four-doors in the segment. By the numbers, the Fusion doesn't have the biggest interior of its kind, but it's arranged very well, to make the best use of the space. 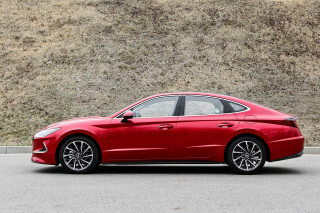 The driving position is lower than you'll find in a Hyundai Sonata, for example, but leg room and head room is still ample, and the Fusion has telescoping steering and well-contoured seats. The center console spreads into knee room a bit. The rear doors swing open wide for easy access; there's less knee and head room than in larger sedans like the Accord, and still the Fusion isn't cramped unless you try to jam in a third adult across the back row. The 16-cubic-foot trunk is big and the opening is wide, too; Hybrids store their batteries back there, so volume is down and the rear seats don't fold flat like they do on other models. The 2012 Fusion isn't the high achiever in this class for safety, but it performs pretty well. The IIHS gives it a Top Safety Pick honor, with top scores in all tests, but its federal NCAP scores include a three-star rating for frontal impact. Curtain airbags and stability control are standard, and the Fusion offers a blind-spot monitor system, Bluetooth, and a rearview camera as options. All models have standard climate control; power windows, locks and mirrors; a tilt/telescoping wheel; an AM/FM/CD player with an auxiliary audio jack; and split-folding rear seats. SEL and Hybrid models get standard leather upholstery; Bluetooth; SYNC; and 17-inch wheels. 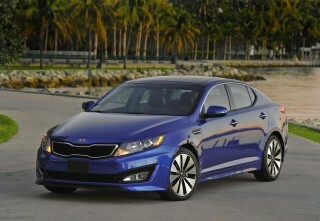 Options include HD Radio; Sony audio; a sunroof; real-time traffic information; and a navigation system. The look of the 2012 Ford Fusion is dated, but it's holding up well; and the no-nonsense look of the interior still has plenty of appeal in a field of increasingly busy designs in rival models. The Ford Fusion now has one of the more aged designs among mid-size sedans, yet it's readily apparent that styling remains one of the reasons the Fusion remains so popular. With a clean, crisp look, framed by its thick-barred grille and squat taillamps, the Fusion still looks smart. The Fusion owes some of its style to the Ford 427 concept that was out on the auto-show circuit years ago (and went on to influence styling in the larger Taurus), and the Fusion isn't proportioned like every other front-drive mid-size sedan. With its cabin somewhat more hunkered back, and front fenders bowing out from some front angles, there's more than a hint of sport sedan. Yet from the side, the Fusion's pretty traditional, almost plain. Inside, the Fusion also hits a sweet spot between functionality, austerity, and just a touch of flamboyance. It's way less extroverted than the wild collection of curves inside the new Hyundai Sonata--or even that of the new 2012 Ford Focus--though we're apt to think the Fusion's interior will wear better over time. If you order the optional navigation system (included on all Fusion Hybrid models), you get a large, clear LCD display that still stands out as among the better in this class. 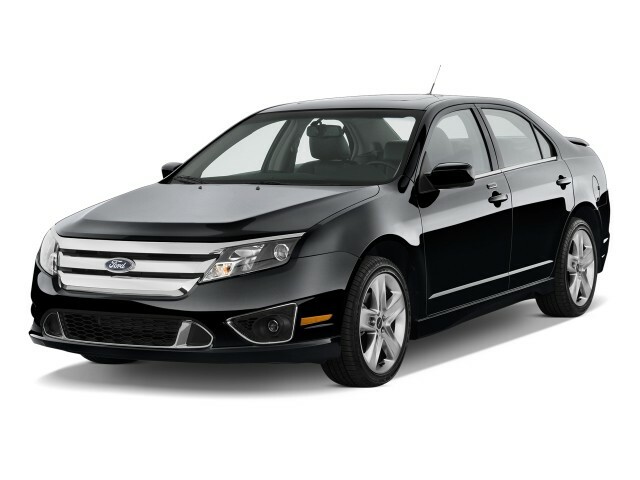 Crisp handling and responsive powertrains make the 2012 Ford Fusion more fun to drive than the typical mid-size sedan. Depending on how much performance you want (and your budget as well as gas-mileage requirements), the 2012 Ford Fusion comes in several flavors, ranging from frugal and adequate to punchy and responsive, and even includes a Hybrid model. The 175-horsepower, 2.5-liter four-cylinder engine and a six-speed manual transmission work well together as the base combination in the Fusion, and it now includes a manual-mode button on the gear lever. These models are plenty responsive, even with a full load, though they expose a coarser edge when driven hard. Opting up to the 3.0-liter V-6 gives you 240 horsepower and flex-fuel capability, but less refined noises and responses than you'll find in the Fusion Sport's 263-horsepower, 3.5-liter V-6. That V-6 improves acceleration quite a bit, and the standard six-speed automatic does a fine job of staying with your driving demands. There's an optional all-wheel-drive system for V-6 models, but gas mileage suffers a bit. For the best fuel economy--and decent performance, actually--there's the 2012 Fusion Hybrid. The Hybrid teams a 156-horsepower four-cylinder with an electric motor running at the equivalent of 40 horsepower, for a total of 196 hp. It achieves an excellent 41 mpg in city driving, and it has an EV-only model that allows the sedan to run off battery power alone up to 47 mph. Overall, it's one of the best-integrated hybrid systems we've driven, with smooth transitions. Handling remains a Fusion strength, whether you choose the base four-cylinder, the V-6, or the Hybrid. Steering is well-weighted, and the suspension is firmly tuned for handling while absorbent enough. Even with big wheels and tires and tauter suspension on Sport models, and even with all-wheel drive, the Fusion rides well yet feels more agile than most four-doors in the segment. A roomy interior and simple but high-quality cabin appointments give the cabin of the 2012 Fusion plenty of appeal, although Fusion Hybrid shoppers should be aware of limited trunk space and versatility. If you're shopping only by the numbers, you might miss how roomy the 2012 Fusion's cabin is; among mid-size sedans, it's now close to the largest, but it's arranged to make good use of what's there. Good fit and finish also make it very desirable in a way that spec panels aren't going to show. You'll find a slightly lower driving position in the 2012 Ford Fusion than you will in some other mid-size models like the Hyundai Sonata or Toyota Camry. But at the same time, there's good outward visibility, as well as plenty of headroom and legroom--although the center console spreads a bit wide against inboard knees. Well-bolstered front seats make it long-distance friendly, as does the telescoping steering wheel. In back, there's enough leg room for most, and the back doors open wide, to ease entry and exit. Only here is the Fusion's slightly shorter wheelbase and overall length exposed; there's a little less room to sprawl out than in the larger entries in this class, like the Accord and Sonata--and fitting three across can be a pinch--but they're nicely contoured for adults. One notable down side is trunk space. While the standard four-cylinder and V-6 models have a roomy 16-cubic-foot trunk, Hybrid models make do with a smaller 12 cubic feet (the price of fitting in an additional battery pack). 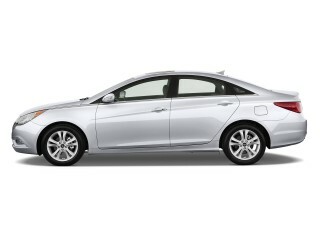 And one other sacrifice in the Fusion Hybrid is that you can't fold down the rear seatbacks, as in other models. But in any case, the regular shape and low loading floor helps make the most of it. And with storage bins in the center console, a deep glove box, and door pockets, the Fusion offers plenty of places for smaller items. Interior appointments in the 2012 Ford Fusion remain pretty impressive, in a simple, honest way. Although the design isn't flamboyant and the feel of the trim isn't lavish, the Fusion has reasonably good-quality plastics, plenty of sound deadening, and good fit and finish, with base four-cylinder models offering an especially refined place for the money. The 2012 Ford Fusion has a very respectable, but not class-leading, set of crash-test ratings. The 2012 Fusion isn't the high achiever in this class for safety, but it's rated pretty well for occupant protection and has an impressive list of features. The Insurance Institute for Highway Safety (IIHS) gives it a Top Safety Pick honor, with top scores in all tests, but its federal NCAP scores include a three-star rating for frontal impact; it gets a more respectable four stars in side impact, as well as overall. A rearview camera system and active blind-spot monitor system are available on the 2012 Fusion. Other standard safety features include dual front, side and curtain airbags; anti-lock brakes, traction and stability control; and active headrests. The 2012 Ford Fusion is well equipped in most of its trims, but it doesn't yet offer the convenience (and controversy) that is MyFord Touch. Between four-cylinder, Hybrid, and V-6 models, and spanning base, S, SE, SEL, and Sport trims, the 2012 Ford Fusion covers a broad swath of the family-car segment. All models have standard climate control; power windows, locks and mirrors; a tilt/telescoping wheel; an AM/FM/CD player with an auxiliary audio jack; and split-folding rear seats. SEL and Hybrid models get standard leather upholstery; Bluetooth; SYNC; and 17-inch wheels. Options include HD Radio; Sony audio; a sunroof; a navigation system with real-time traffic information; a SecurityCode keyless-entry pad; and 17-inch wheels. Options on the Fusion include a rearview camera with output displayed either in the rearview mirror or in the optional navigation system; Sirius Travel Link real-time information, from traffic to weather to sports scores; HD Radio; a moonroof; and a high-wattage Sony audio system. If you opt for the 2012 Fusion Hybrid, you'll also get enhanced graphics and displays for fuel economy, battery usage, and the SmartGauge system that trains drivers to cruise more efficiently. The Ford Fusion isn't yet offered with the MyFord Touch system, which several Ford models (including the smaller Focus) now get; it eplaces the buttons and switches for climate and audio controls with an LCD touchscreen and voice-activation controls--to results that you might either love or hate. Green buyers have choices, in either the fuel-efficient four-cylinder models of the 2012 Ford Fusion or in the 41-mpg Ford Fusion Hybrid. The 2012 Ford Fusion isn't the highest-mileage of the mid-size sedans in non-hybrid form, but the Fusion Hybrid stands among the greenest sedans available at any price. 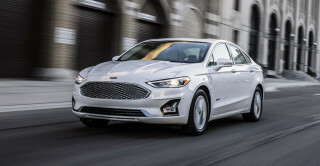 Front-wheel-drive, four-cylinder Fusion sedans with Ford's excellent six-speed automatic are rated as high as 33 mpg on the highway, and we've experienced more than 30 mpg in daily use for these versions; unfortunately, V-6 models aren't nearly as good, at 18/27 with front-wheel drive or just 17/25 with all-wheel drive. With an EPA city rating of 41 mpg, the 2012 Ford Fusion Hybrid delivers its best in congested commuting conditions (while other hybrid systems like the one in the Hyundai Sonata Hybrid tend to do better on the highway) and is simply one of the greenest sedan picks on the market. Buying a new Ford with a 4 cylinder engine was a first for our family. Most of my previous cars were at least 6 & 8 engines, but economy was most important this time around: but it's been a disappointment. As... Buying a new Ford with a 4 cylinder engine was a first for our family. Most of my previous cars were at least 6 & 8 engines, but economy was most important this time around: but it's been a disappointment. As we only get 22-24 MPG! Getting onto the freeway safely takes a while to get up to speed, and govenor Engaged is horrific. The motor seems to struggle at times with no 2 nd gear to give more boost . The kick down compression feature helps on long declines of hills Fabric upholstery is cooler in summer, long wearing materials work well, but I miss leather. 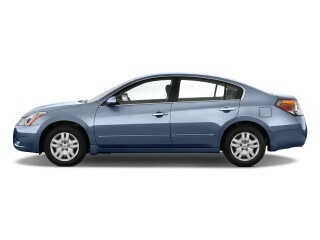 The trunk is a generous cavity with fold down rear seats open to great hauling ability, one of this cars best feature. A great overall family car that's fun to drive and easy to own. The canvas type seat covers are a little to easy to get dirty compared to velour seats we have had in the past. Great powertrain and MPG too. Very roomy, but still sporty looking. Good gas mileage. I think, by far, this is the best car I have ever owned. 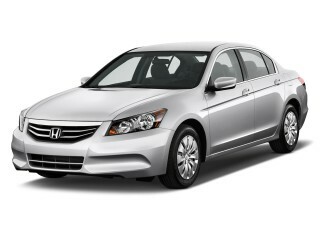 it performs well at highway speeds or around town with plenty of power coming from the 4 cylinder. Gas mileage has been averaging 23 in the city and 34... I think, by far, this is the best car I have ever owned. it performs well at highway speeds or around town with plenty of power coming from the 4 cylinder. My first Ford car and I am completely satisfied. Highly recommended for a family who need to have a car that will meet their current budget. A great highway car.